Over 100 people and marketing leaders joined us to learn about employer branding, storytelling and the future of work from our talented panelists: Denisa Orlandea with Teekay, Chelsea Scholz with Unbounce, Lauren Nipp with Nurse Next Door, and Nichole Marshall with Earls Kitchen + Bar. Find where your audience is, and be there. With the sheer number of social media channels, it can be tough to figure out where to invest your energy and resources for optimal return. 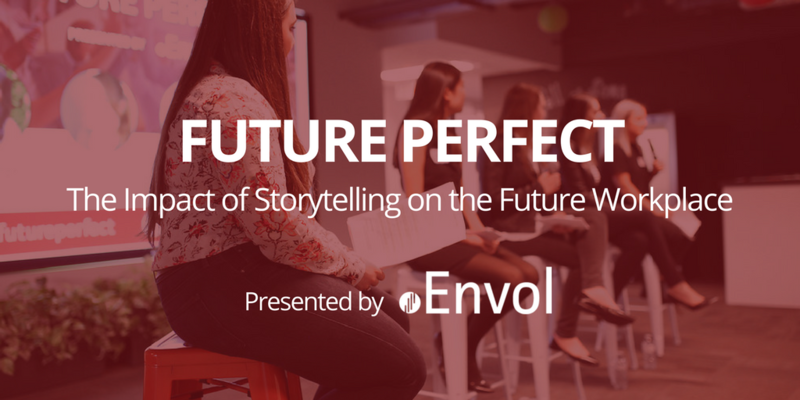 Luckily, successful storytelling isn’t about being everywhere – it’s about being where your audience is. Start by understanding who your people are, where they hang out online, and what stories matter to them. Start by understanding who your people are, where they hang out online, and what stories matter to them. Localized content is important. Tell stories that people care about and that they can identify with. Storytelling means show, don’t tell. With social media and web platforms like Instagram, Snapchat and Glassdoor, we have more visibility than ever into what it’s actually like to work at your organization. This has made it harder to hide – especially for organizations who don’t walk their talk. Stop telling, start showing. 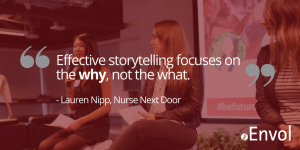 Effective storytelling focuses on the why, not the what. Take advantage of digital platforms, sharing stories through multiple mediums including video and images. Don’t have the luxury of an in-house videographer? No problem! High production video is a great asset, but you can have a powerful impact with authentic, real video created by your own in-house team. Don’t forget to crowd-source images from your people! You are sitting on a content goldmine: your people’s stories. 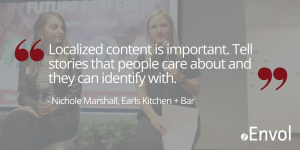 Engage your people in creating content by tapping into their stories. This plays double-duty, helping you build your content portfolio through and activating your people as employer brand ambassadors. 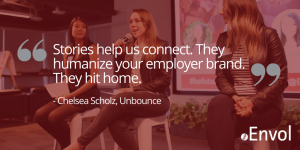 Humanize your employer brand, creating stories that hit home and help us connect with your brand on a more human level. Amazon reviews, Glassdoor, and your employees are great places to start sourcing stories. Identify which of your people are already engaged with your brand on social, leveraging them as brand ambassadors to help share your stories authentically. Don’t “set it and forget it”. Employer branding requires an ongoing investment in storytelling to build your community and create meaningful conversations. Build a strong partnership between HR and marketing to collaborate and share the workload. Give your people the tools and content to share, including social media training, to amplify your reach. Be clear on how you will measure the ROI of your storytelling efforts, including social media engagement metrics and landing page data. Be realistic about when to measure results. Employer branding is a long-term play. Employer branding is a beast – it can feel overwhelming. Don’t be afraid to start small. Consider your organization’s goals, resources, and capacity when deciding where to begin. Every organization is different – what works for you may not work for peer organizations in your industry. Employer branding is a process of trial and error. Fail forward. Try things until you figure out what works for your organization and your employer brand. The most important thing is just to start. Still wondering where to start? We can help! Take advantage of our FREE Employer Brand Assessment to understand how your digital employer brand is performing, and how you stack up against the competition.